SkyBird (left) is a two-year-old Pitbull who doenst listen well, pulls on the leash and competes for attention. Her room mate Abrams (Right) is a three-year-old Black Lab who isnt always the best listener, gets over excited and has some anxiety. Rounding out this trio is Husker (in the back), a six-year-old Shih tzu Poodle mix who is sometimes aggressive to new dogs and humans due to a previous guardian’s abuse. It was quite the greeting when I arrived for the session with the pair of guardians doing their best to move the dogs away from the door far enough for me to come inside. Out of the three dogs, Husker was by far the best behaved. This is likely due to his age and the fact that he is considerably smaller than the other two dogs. Perhaps in his case, it’s safer to simply move away and get out from being underfoot. I like to give dogs an opportunity to calm themselves down, but after a few moments it was clear that Abrams and Skybird’s energy was bouncing between them escalating the situation. It was a tossup between the Lab and Pit, but I decided to use the leash to calm Skybird down. Normally within a few minutes of the dog being placed on the leash, their energy changes pretty dramatically. In fact after using this technique for several years I can’t think of another dog that was as persistent about getting off the leash as Skybird was. When it comes to dogs and dog behavior, being able to outlast the animal is crucially important. So we sat and discussed the situation while I kept Skybird on the leash in her doggy-timeout until we achieved the desired effect. Now that the dogs had calmed down completely, I was ready to actually start the session! This group is actually a blended family. Skybird and Husker belonged to one of the guardians whereas Abrams was from the other human. 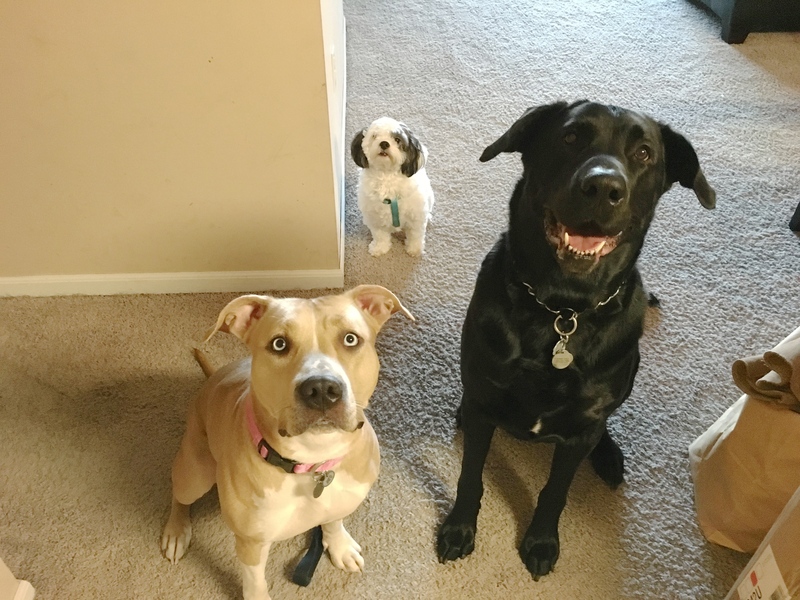 Often times when a couple gets together and each one has dogs from outside of their relationship it can be an interesting adjustment as the dogs and guardians all get used to living together under one roof. I asked their guardians what rules or limits were in place for the dogs. After thinking about it for several minutes, the guardians realized that they didn’t really have any structure in place for the dogs. Abrams was by far the best trained out of the three and he responded pretty quickly to commands. However the female guardian reported that he did not listen to her as well as he did to his primary guardian who is a male. To help both guardians more effectively communicate with their dogs, I went over some nonverbal communication cues and the escalating consequences I like to apply when a dog fails to listen. Use of these nonverbal communication methods will improve the dogs understanding of what their guardians do and do not want from them. Because this is the dog’s native-language it should be much more effective and more quickly digested by the dogs. One of the issues that the guardians wanted to address was Skybird’s habit of whining in protest when placed inside the kennel. After a few questions I learned that some of the ways that the guardians placed the dog inside the kennel had likely resulted in a negative connotation to the kennel. I pulled out a few high-value treats and showed her guardian an exercise I like to employ whenever I’m dealing with the dog who is fearful of a kennel. Many people only place their dogs inside of the kennel when they are leaving. Additionally many guardians do not take the time to make sure their dog is completely comfortable and calm inside of the kennel. This combination often results in a dog who interprets being placed in the kennel as almost a type of punishment. Not only do they have to go inside and lose the freedom to roam their home, their guardian leaves without them. Once Skybird is able to stay inside the kennel with the door open for a full 15 minutes, the next step will be to place her in the kennel and then close the door after a few minutes of her being calm. At that point they should leave the door closed for one minute and, provided Skybird is calm, walk over and open the door. However just because the door is open does not mean the dog should be allowed to exit. After the guardian opens the door, they will step backwards literally one step at a time while keeping theirs hips and shoulders squarely facing the dog. At this point Skybird is still expected to remain inside the kennel. If at any point she starts to move forward, the human will rapidly march directly towards the entrance to the kennel to block her exit. Once she retreats and stays put, the guardians can step back from the kennel two steps at a time (left, right foot). Once she is completely calm, the guardian can give her a recall command, allowing her to exit the kennel. They will need to gradually increase the amount of time Skybird stays inside the kennel with the door closed by one minute increments until that duration also reaches 15 minutes. The goal with both of these exercises is to help the dog practice remaining calm inside of the kennel under varying conditions. As she learns to become more comfortable and practices staying calm, this new behavior should continue outside of the exercise. I also suggested that the guardians purchase several Kong toys so that they can fill them with peanut butter and throw them in the freezer. Before placing the dogs in the kennel, the guardians can retrieve these frozen Kongs and place them inside each kennel. The Kong is designed to occupy the dog for an extended period of time and freezing the peanut butter inside makes it last even longer. Combined with the dog becoming used to being calm while inside the kennel, this strategy should allow the guardians to put an end to the dog’s protesting and whining while inside. Another issue Skybird’s guardian wanted to work on was her behavior while on a leash. Not only did she pull terribly, she was reactive at the sight of other dogs. One of the most important aspects of taking a dog for a walk actually occurs inside the home. Many people mistakenly put the dog on a leash while it is in an excited state and then exit expecting the dogs behavior to change. But the behavior a dog has inside the home is the behavior that they will exhibit outside. We practiced putting Skybird on the leash in a structured way, stopping anytime that she started to show any excitement. This took several aborted attempts before we were able to attach the leash while she remained completely calm. I suggested that the guardians practice this leashing exercise a few times a day even at times where she did not intend on taking the dog for a walk. When we allow a dog to get over excited when we go for a walk this way it becomes a form of classic conditioning often resulting in a dog that gets over excited. By practicing the leashing ritual at times where the guardian does not take the dog out on a walk, we can desensitize the dog. The dog only gets excited because every time the leash comes out, the dog goes for a walk. When we start adding in occurrences where the dog does not go for a walk, the appearance of the lease quickly loses its association. Because of the dog’s strong pulling nature, I fitted Skybird up with a Martingale collar and showed her guardians how to apply the special twist to the leash to stop her from pulling. Because the dogs currently reside in an apartment complex I showed her guardian how to use the stairs as an exercise to help Skybird learn to practice more self-restraint and control. While we were on the walk, Skybird’s guardian communicated that she did have more control than before; likely result of us taking the time to let the dog settle down before we exited. The Martingale certainly gave her more control too, but Skybird was far from what I would call a well-leashed dog. I suggested that they continue to practice on the leash and went through the rules that I used to walk a dog in a structured way. Just like any other skill this is going to take practice. But using the Martingale and taking the time to settle the dog down before leaving will put both the dog and her handler in a better position to succeed. We finished up the session by feeding the dogs in a more structured manner. When dogs live together in a group, eating is often done in the order of the dogs rank. By asserting a little structure and control to the feeding ritual, their guardians will be able to increase the dog’s respect for them each time they feed them. By the end of the session, the dogs were noticeably calmer and were much easier to correct and lead. We even practiced an exercise where I knocked on the door and by the third repetition the dogs hardly barked at all. Having three dogs can certainly be a challenge if they’re not well balanced. Fortunately these dogs are not aggressive or too poorly mannered. But it will be important for their guardians to be consistent in the application of the new escalated consequences, to pet their dogs with a purpose and provide them the leadership. If they are consistent for the next few weeks, the dogs should adopt this new more desired behavior all the time.